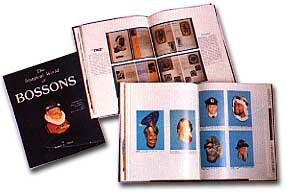 Book I provides an interesting narrative of the development of the Bossons Company which designed, produced and marketed the renowned character wall masks, figurines, shelf ornaments, Ivorex, Briar Rose and Fraser-Art products. A 9" x 12" hard cover edition with full color dust jacket, Book I covers information available through 1982. 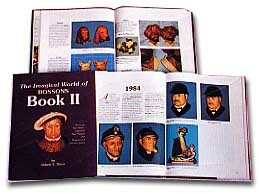 The 238 page book has color photos of over 350 Bossons products and is invaluable in identifying secondary market items. Book II chronicles discoveries and developments of Bossons products from 1982-1994. With 176 pages and 515 color photographs, Book II does not repeat nor is it an update of Book I. Rather it is a continuation of the original work. Book II contains an alphabetical index for both Book I and Book II. Collectors should possess both texts to have a complete reference to aid in the quest for Bossons artwear. Dr. Robert E. Davis, author of both Book I and Book II, and founder of the International Bossons Collectors Society, is retired after 34 years in private practice of Oral and Maxillofacial Surgery. Since retirement in 1993, Dr. Davis has restored the ancestral family home on a farm in Rockmart, Georgia, and is writing an anecdotal and pictorial history of his ancestors. He has devoted much time to the directing of International Bossons Collectors Society, and to the search for additions to his beloved collection of Bossons. The words BOSSONS and IMAGICAL are the registered trade marks of W.H.BOSSONS Ltd. of England.